A case against Trump for inciting violence goes to trial. Did Trump Intentionally Incite Violence at a Campaign Rally? A federal court just sent a case suggesting he did to trial. 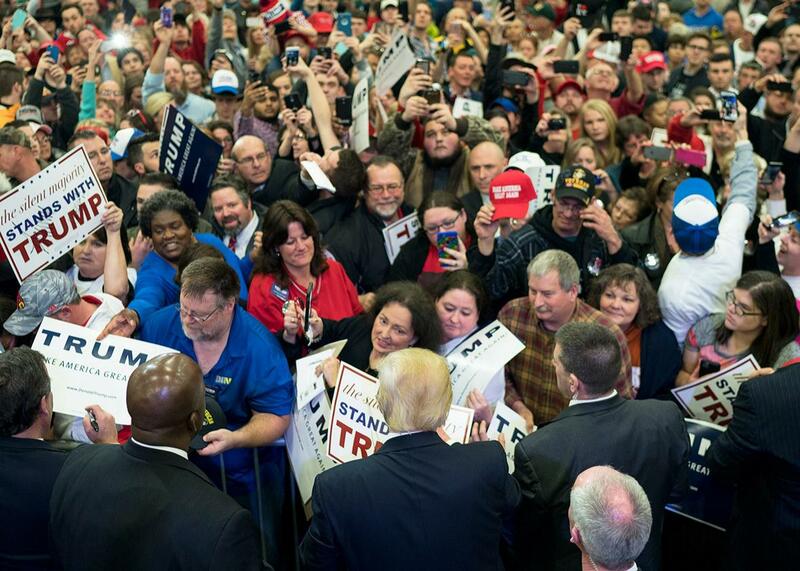 Donald Trump signs autographs on March 1, 2016, in Louisville, Kentucky. Donald Trump seems determined to test the limits of the First Amendment’s guarantee of freedom of speech. First there was his possibly libelous accusation that former President Obama had wiretapped him. Now, thanks to a ruling by a federal trial court, three people who allegedly suffered injuries after being beaten at a Trump rally can proceed with their case against him and other defendants. The theory is a jury could find that then-candidate Trump incited the crowd to violence against them. At the rally, Trump called for forcible removal of the protesters, yelling: “Get ’em outta here!” Some of the crowd did just that and allegedly caused the assault and battery resulting in the lawsuit. This video shows one of the plaintiffs being pushed by Alvin Bamberger, another named defendant. Do the plaintiffs have a case? They have enough of one that a jury should hear their arguments. The First Amendment is broad, but it stops short of protecting speech that’s intended to spur a crowd to violence. The plaintiffs claim Trump violated a Kentucky criminal law that prohibits inciting others to riot; the statute allows plaintiffs to recover for any injuries caused by whoever violates the law. There’s also a common-law tort claim for negligence alleging Trump “knew or should have known” that his statements would lead to violence. Trump’s lawyers tried to get the complaint tossed out, claiming his comments were a direction to security personnel rather than an effort to stir the crowd to action. They also claimed that his speech is protected by the First Amendment. But the trial judge wasn’t buying either argument. Sure, said the judge, it’s possible Trump was trying to direct security. But that’s for a jury to decide—and is no reason to throw the case out without giving the plaintiffs the chance to prove their case. Cases decided after Brandenburg make clear that the court gives a wide berth to even the most incendiary kind of speech as long as the threat of violence isn’t imminent. In this case, a jury might or might not conclude that saying “get ’em out!” to a crowd of riled-up rally-goers is likely to lead to present violence. And one factor in these cases that the Supreme Court has said is important is whether violence actually occurred soon after the provocation. In a 1982 case involving a boycott of white merchants, Charles Evers, then–field secretary of the NAACP, said boycott violators would be “disciplined” and went on to colorfully illustrate one possible means of doing that: “If we catch any of you going in any of them racist stores, we’re gonna break your damn neck.” The court was concerned enough to suggest that Evers might be liable if “that language had been followed by acts of violence,” but since violence didn’t occur until “weeks or months” after the speech, the First Amendment protected him. Here, of course, violence actually followed right after Trump issued his “get ’em outta here” directive, so the case looks reasonably strong on that score. That’s not enough to ensure victory for the plaintiffs, though. The standard also requires that the defendant’s intent was to incite violence. That’s where Trump’s two arguments converge: I was talking to security people, not to the crowd. Plus, I didn’t intend for the crowd to commit any violence against the protesters. If this suit does go to trial, this will likely emerge as the crux of the case. Unfortunately for Trump, the Federal Rules of Evidence will probably allow the plaintiffs’ attorneys to present similarly threatening statements from other rallies. Past actions by a party can be introduced as evidence for certain purposes, including as a way of establishing intent. It’s not like there’s a lack of video documentation of Trump rallies. Mashable has one useful compilation, which sure makes it look like Trump wasn’t always talking to “security.” Distressing highlights include such statements as: “In the good old days this doesn’t happen because they used to treat them very, very rough” and most damningly, “Knock the crap out of them,” clearly not directed at security guards. Courts are cautious in this area, as they should be. Political rallies are places where preserving First Amendment rights is critical. But they’ve also long been sullied by violence, as anyone who lived through the 1968 presidential campaign will recall. Back then, supporters of segregationist George Wallace clashed with protesters from the other side—a fiery division that the 2016 campaign dismally called back to life. Indeed, the Louisville incident symbolizes our sharp racial divide. Video from the event shows a sea of white people shoving Nwanguma, a black college student. Of course, individuals that commit acts of violence can be held criminally and civilly liable for their actions, but the First Amendment should usually shield speakers at rallies. If they’re held responsible for the acts of their followers, we could lose some of the messy yet necessary clash of views that’s the whole point of guaranteeing free speech in the first place. But even if Wallace and his modern-day counterparts are legally allowed to spew hateful rhetoric, they still have to stop short of actually inciting the crowd to violence. The Brandenburg standard perfectly captures where the line between the two lies: While candidates shouldn’t be subject to lawsuits for advancing even the most outrageous ideas, they can and should be called to account for intentionally stirring up violence. That’s also why the incitement claim is stronger than the common-law negligence claim. The incitement claim is a civil action that argues Trump violated criminal law while the negligence claim only says that he acted unreasonably. The judge probably should have dismissed the negligence claim because it’s probably not enough to overcome the First Amendment, which expects and tolerates unreasonable behavior. It’s only when speech intentionally provokes violence that victims’ rights prevail, and as the judge said in this case, Trump’s statement amounted to “an order, an instruction, a command.” If a jury finds he was barking at the crowd rather than at security, civil damages for inciting a riot should follow. Intent can be, and often is, inferred from the circumstances. Trump is allowed to say what he wants—even when it’s unreasonable. But this might finally be something he can’t get away with.